Perhaps you remember a bit of news a while back that about Delta Air Lines’ test program of pre-loading some carry-on bags for passengers before flights. The airline said the complimentary service was designed to speed up the boarding process, while some said the early gate valet program might just be testing a new optional paid service. I had forgotten all about that trial program, so was surprised when the young man pictured above approached me at the gate at JFK airport on Saturday while I was waiting for my Seattle flight. He offered to take my bag and put it above my seat before the plane began loading. I remembered writing a story about the program, so of course said yes – and then proceeded to pepper the young man with questions about how the trial was going. He said while plenty of passengers loved the idea, there were some that were wary and didn’t want to be separated, even for a short while, from their bags. And sure enough, just moments after tagging my bag, giving me a valet receipt and moving on, another passenger ran up to the gate agents to report that someone was trying to scam passengers out of their bags. “Not a scam, sir,” the agents told him. “Well, this is New York. You never know,” said the passenger, who then gave the bag valet his bag. I also asked the gate valet how many bags per flight he pre-loaded and how he chose which passengers to offer the service to. He said he offered the service first to elderly passengers, then to families traveling with children and then chose randomly from the passengers in the gate area. I didn’t have any kids with me, so hoped I fell in to the “assorted” not “elderly” category. Although not ten minutes after I gave the valet my bag, I had a brief “where’s my bag!” moment as I was collecting my things as the plane was getting ready to start loading. 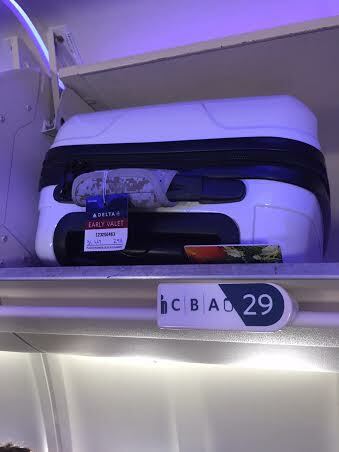 When I got on the plane, there was my bag above my seat. Just as promised. And the early gate valet service would have indeed shaved a few seconds off my seating process – had I not stopped in the aisle to take a photo.